At the best of times I have an irrepressible sweet tooth – during the festive season it goes into overdrive. But I’ve finally pulled myself away from the tin of Quality Streets and banished the pesky sugar plum fairies dancing in my head. 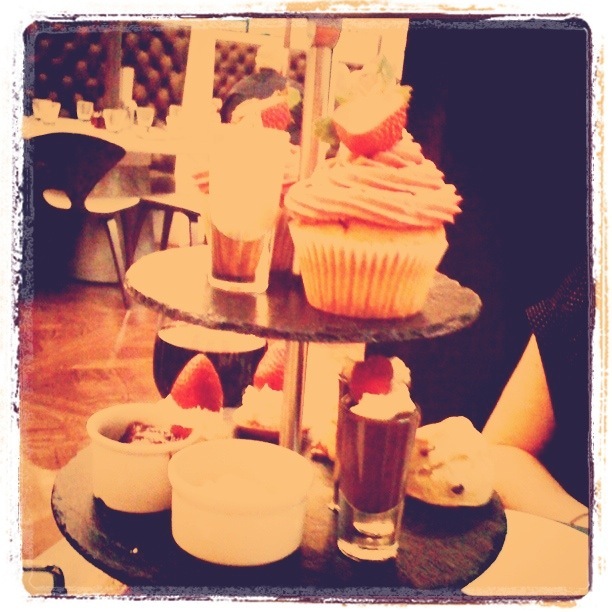 But to truly satisfy my insatiable sweet cravings I seek out the ultimate in afternoon teas. Admittedly Glasgow is a plethora of choice – and whether you’re after the more traditional granny inspired or a swank Champagne affair, you can find it here. I opt to stray from the more customary and go for something a little more swish at the Corinthian on Ingram Street. I figure after months of walking past the enticing windows, it’s time to put the allure to the test. Thankfully their standards are as high as my expectations and I’m not disappointed. Yes it’s decadent – but thankfully it’s posh without being pompous. And refreshingly the staff are as welcoming as their comfy lush surroundings. I’m admiring the beautiful interior and deep richness of everything when the multi-tier of perfection arrives at our table. It’s a flawless fusion of traditional and innovative new delights. The bottom layer is filled with a variety of sandwiches on wholesome multi-grained breads – the second tier contains mini scones with clotted cream and jam as well as a beautiful vanilla bavaroise eloquently served in a shot glass. Saving the very best for last, the top tier boasts a gorgeous cupcake topped with an impressive amount of icing and the world’s freshest strawberry. And if the first shot of vanilla bavaroise wasn’t enough, we’re treated to a second chocolate variety. Oh yes – and of course there’s the selection of speciality teas to choose from. So £14.50 later my sweet tooth is well and truly satisfied – as far as I’m concerned, money well spent. And for those of you feeling particularly flush, you can opt for the £21.95 afternoon tea that includes a glass of Mumm Cordon Rouge Champagne. If you’re looking for something a little more traditional with a quirky twist, a very close second would have to be the Butterfly and Pig tearooms on Bath Street. Airing on the side of shabby chic – it’s a bit like going to a grandma’s wee house for afternoon tea – that is if Nan’s a little eccentric and happens to be an avid collector of mishmash china, fabulous furniture and makes some of the most delicious cakes in town.